Common Name: White-stiff silkworm, body of infected silkworm. Part Used & Method for Pharmaceutical Preparations: The silkworm, dead and stiffened due to the infection of beavveria bassiana, is dried in the sun. Properties & Taste: Salty, pungent and neutral. Functions: 1. To subdue endogenous wind and stop spasms; 2. To expel wind and stop pain; 3. To dispel toxins and disperse nodules. 1. Convulsions due to high fever and epileptic spasms. White-stiff silkworm (Baijiangcan) is used with Arisaema tuber with bile (Dannanxing), Gastrodia tuber (Tianma) and Ox gallstone (Niuhuang) in the formula Qianjin San. 2. Chronic convulsions with prolonged diarrhea due to deficiency of the spleen. White-stiff silkworm (Baijiangcan) is used with White atractylodes (Baizhu), Pilose asiabell root (Dangshen) and Gastrodia tuber (Tianma). 3. Windstroke manifested as deviation of eyes and mouth or facial spasms. White-stiff silkworm (Baijiangcan) is used with Scorpion (Quanxie) and Typhonium tuber (Baifuzi) in the formula Qianzhen San. 4. Wind-heat sore throat. White-stiff silkworm (Baijiangcan) is used with Platycodon root (Jiegeng), Ledebouriella (Fangfeng) and Licorice root (Gancao). 5. Wind-heat headache and lacrimation from exposure to wind. 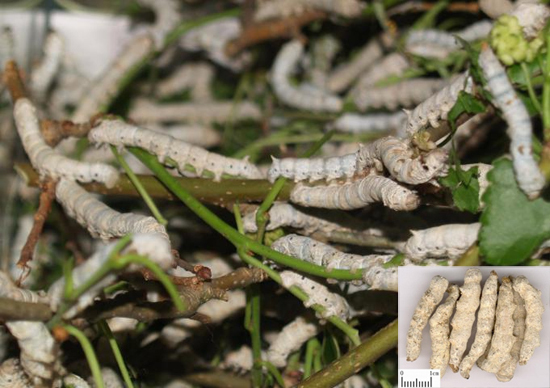 White-stiff silkworm (Baijiangcan) is used with Mulberry leaf (Sangye), Schizonepeta (Jingjie) and Shave grass (Muzei) in the formula Baijiangcan San. 6. Rubella and itching. White-stiff silkworm (Baijiangcan) is used with Cicada slough (Chantui) and Mentha (Bohe). 7. Scrofula. White-stiff silkworm (Baijiangcan) is used with Tendrilled fritillary bulb (Chuanbeimu) and Prunella spike (Xiakucao). Dosage: 3-10 g, decocted in water for an oral dose. The unprepared herb is best for dispelling Wind Heat. Cautions & Contraindications: The raw substance is used for wind-heat syndrome, the fried substance for other applications.